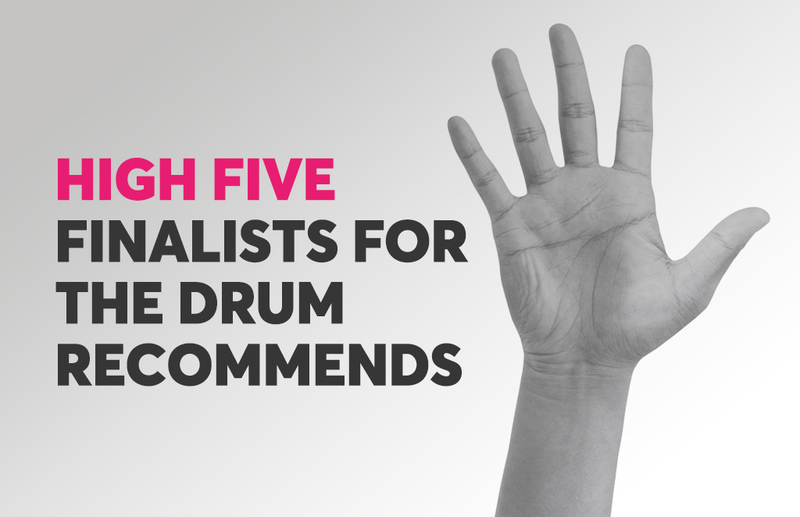 The Drum Recommends nominations have been announced, and we’re delighted to be finalists in five categories: Creativity/Innovation, Client Service, Effectiveness, Design and Brand Strategy. We’re especially proud as being finalists in these categories recognise what we keep closest to our heart – great creativity, excellent client service and effective communications that move the dial on business performance. It also acknowledges our founding roots and love for design, as well as the exciting brand work we produced last year (check out these case studies here and here!). Unlike other industry awards, The Drum Recommends (previously known as the Recommended Agency Register Awards) are based exclusively on how customers rate and rank their partner agencies. The only way an agency can become recommended, or shortlisted for an award, is by having happy clients who think you do brilliant work and want to talk about it. We are very grateful to have such fantastic clients who appreciate what we deliver, and for the lovely ratings and recommendations they have given us. Following our successes of being ‘Company of the Year’ and ‘Creative Communications & Digital Business of the Year’ in 2018 at the Toast of Surrey Awards, we’re keeping our fingers crossed for another award winning year!